There is No Box - Fizz Boom Read! Colorful Sprinkle Watercolors: This would work for toddlers, preschoolers, and school-aged kids. Older kids could draw details over the watercolor pattern, or use the water-colored pattern to make the Eric Carle/Lois Ehlert inspired collages in the Kids' Science and Art chapter. Teru Teru Bozu: Depending on how you make this, it would work for toddlers and preschoolers -- made with tissue and rubber bands -- or school-aged kids and teenagers -- made with fabric or men's hankies, fabric markers, buttons, sequins, stitching, etc. Teens in your manga/anime clubs may also like hearing about the Japanese origins of this craft. Science Center: The Leaf Identification Station would likely go over better with school-aged kids than with the early literacy crowd. Bubbling Magic Water Bottle/DIY Lava Lamp: School-aged kids will be ALL OVER this. Babies, toddlers, and preschoolers might like watching these lamps bubble, but it's mostly way too complicated for them and hard to implement with a large group of little ones, unless you just make one. Germs, Germs, Everywhere! (Kids Manual, p. 95): This experiment is mentioned in the CSLP manual as one for children, but teens, especially middle school age patrons, would also be interested in this program. This experiment is covered under the Grossology 101 program suggestion, which, given a little thought, could inspire a hilarious and well-attended program for teens. Play with Your Food--Kitchen Science (Kids Manual, p. 84): Teens love food programs. Especially if they get to eat the food when you're done. Consider a kitchen science program for your teens. Some of the manual ideas will be a little too simple, but a simple search on Pinterest should give you loads of great ideas. Pop-ups and More: The Science of Books (Kids Manual, p. 159): The manual recommends making a pop-up craft with kids while discussing the art of engineering books. This could be a great program for either teens or adults because pop-up crafts can get very complex. Crafty Magazine offers a tutorial on a too-difficult-for-kids dinosaur pop-up book and Extreme Cards and Papercrafting also offers an array of more complex pop-up craft tutorials. Going Viral (Teen Manual, p. 34): Teens are likely to lose interest in the activities in this section fairly quickly unless you have a small, focused group. In particular, the Glitter Germs activity and the Balloon Germ activity would make for a very concrete and fun lesson to go along with a storytime for pre-school age children. You would obviously need to engage the adult companions to help with the Glitter Germ activity. Building Catapults (Teen Manual, p. 37): Catapults are suggested for teens, but school age children would have a ball with this activity. Forensics: Crime Scene Techniques (Teen Manual, p. 39): There are several suggestions for forensic science programs in the Teen section of this web site. Consider offering adults a forensic science program as well. Music from Objects (Teen Manual, p. 67): In the Teen Section of the web site, there are all kinds of details and suggestions for homemade instruments and activities. When completing that section, however, there were a multitude of ideas for very simple instruments for younger children. With a little research this idea could easily adapt for preschool or school age children. How Smart Are You? Contest (Adult Manual, p. 17): In Council Bluffs, each month we offer patrons a self-directed contest activity like the one described here. Each of our three departments uses the same theme, but comes up with age-appropriate questions. At the end of the month, all the correct entries are put into a drawing for a $20 gift card. These activities have been very popular because it gives people something to do while they're at the library. Try adapting this program to offer it to your entire patron population. Paper airplane programs are a great, adaptable program for all age groups. Kids and teens of all ages love paper airplanes! 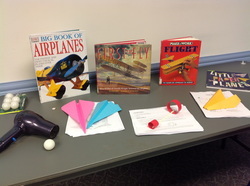 For a full program plan for elementary age children, check out the Association for Library Services to Children (ALSC) web site post for STEM Takes Flight: Airplane Science. As written, the program plan looks highly adaptable for any size library, with any size programming audience. In addition, this is a program that would work for different age groups. Although the ALSC program focuses on elementary age children, there's no reason this wouldn't work for teens. Choose more complex airplane designs and add a competitive element and VOILA! Teen appropriate. If you can manage it, this program would be made even better by allowing children and/or teens to fly their airplanes somewhere in the library where it ordinarily wouldn't be allowed. When you do this, make an announcement to invite the public to view the flights for extra exposure for your programs. This activity is recommended by a blogger at I Can Teach My Child who adapted it for her own kitchen after a visit to the Smithsonian Museum of American History. You use the basic makeup of a cake to allow a young child to create their own cake recipe. This would be great as a family event or you can age the program up by having teens or adults figure out all their own measurements and just generally giving them more control over the activity. As written, the activity is written for young school age. You will need access to an oven and you will want to have participants work in groups so that you don't have more cakes to bake than your oven can handle. For any age, you'll want to use baking time for cleanup time, but you will also want to have other activities available to keep the group busy. Be sure to display inventive cookbooks for patrons to look at and check out. You could also invent your own cookies and use toaster ovens if your meeting room area is not equipped with a kitchen.